This interview and post to help you get it done and earn money on the go is brought to you by Microsoft Office 365. All opinions are our own. With the holiday season quickly approaching, the need to get things done from literally anywhere has never been more desirable. What would you give up for less time chained to your work desk? That’s the question answered in a new Harris interactive survey and the results are both humorous and surprising. Mom, author, blogger and entrepreneur, Jen singer, knows a thing or two about how to get it all done and she is joining us to share how to juggle work and life with help from technology. This morning, I had the opportunity to speak with Jen for a few minutes about how Microsoft Office can help you Get it Done! Did you know today is Get it Done day? I didn’t! Check out our interview with her, then read on for more information about how Microsoft Office can save you time and help you earn money on the go. Were you surprised by any of the study results? I was a bit surprised by the bathroom one, but then again, I write in my head constantly, even when I’m using the bathroom or taking a shower. Like Jen said, thinking is working! I can’t even tell you how many posts I’ve written in my head while shaving my legs! I try to make every day get it done day, but now I’m inspired to really get moving and accomplish as much as I can before the end of the day. Of course, the fact that Microsoft is hosting that amazing contest for a chance to win an adventure of a lifetime by entering their Get it Done Anywhere Contest really inspires me to push harder! In case you need a recap, entering is so easy! Just upload a photo of yourself working anywhere- the park, the coffee shop, the middle of a football game- and submit it on their Microsoft Outlook Facebook page, tweet it with the hashtag #GetItDone or upload it to Instagram with that hashtag. I’ve been using Microsoft Office for about a decade now. With a full suite of great programs, it definitely helps me be more productive. I even use the spreadsheets to keep track of my holiday spending! I started that back in 2005, when Jacob was born. Each year, I add a new sheet to my Holiday Gifts database. I can see what I spent last year and compare it to this year. 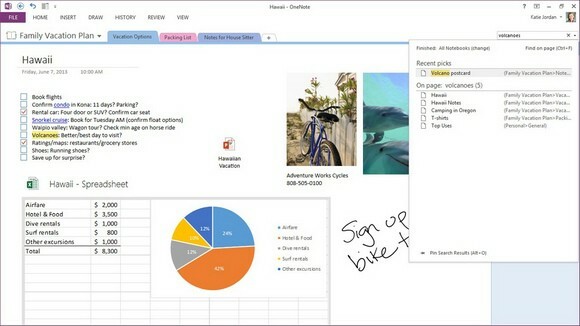 I started using Office 365 a few months ago and still haven’t checked out all the great features. Now that Jen pointed me in the right directions, I can’t wait to start exploring. I work outside the home during the holiday season. We have a lot of down time in the beginning because it’s so slow. I am planning to work on the OurFamilyWorld properties editorial calenders during that time. I joke with Olfa that I’ll have us scheduled through December of next year by the time Thanksgiving rolls around! I’m quite serious though! With my tablet and OneNote, I can look for inspiration, jot down notes and be productive anywhere. What about you? Will you be getting it done today? Don’t forget to enter the contest! Where would you go if you won the dream adventure? I love that this allows for you to be productive just about anywhere! Thank you for sharing. To get things truly done, I think I need to go into a cave in complete darkness to hide any sort of crazy distractions that always get to me! LOL, I hear you there! I work in a nook in the kitchen, which means there is always traffic and distractions around me! I would so love to have a quiet cave to work in, even if just for one day! Like the organizational tips that Jen presents. I haven’t tried 365 yet, but would so love to! It’s definitely different! It took me a little while to get used to it. I love that it gives you a ton of free Sky Drive space. When I write an article, I can easily back it up in the cloud. I haven’t tried Microsoft Office 365, but this looks like something that could really help me and get me organized! Can’t wait to get it! It definitely does help with organizing! I’m still checking out all the new features! oh I haven’t tried this, thank you for sharing, I will have to tell my husband about it. If he does a ton of work on any of the Office products, he’ll love it! Jen has some excellent tips for staying organized with Microsoft Office 365. Looks like this holiday season could be much easier to balance it all! I have not tried Microsoft Office 365 yet but now I want to! I am a huge Microsoft fan!